After beginning with a complete field of 68 teams in the 2019 NCAA Tournament, we're now down to just two after the Final Four action that took place on Saturday night. Some of the biggest programs in college basketball have been knocked out, so Monday night, the national championship will be decided by Texas Tech and Virginia. Below, as you follow along with your own bracket, you can have a look at how our experts here at CBS Sports saw the most exciting postseason tournament in sports playing out. Don't forget to download the official 2019 NCAA Tournament printable bracket and print enough for everyone in your pool. It is especially helpful to jot down notes and picks as you look at our expert's selections. Let's get to the brackets. To enlarge the brackets, simply click on them. Parrish: Duke and North Carolina have never played in the NCAA Tournament. Hard as that is to believe, it's true. But it's also something I'm predicting to change this season because I have the Blue Devils and Tar Heels meeting in Minneapolis. And wouldn't that be something? Duke-UNC IV in the final game of a season that's been focused on Zion Williamson and his teammates since Opening Night. And, yes, I will predict the Blue Devils to close the same way they opened -- by beating a fellow blue blood on a big stage. In November, the victim was Kentucky. In April, it'll be UNC. Final score: Duke 76, North Carolina 73. Zion Williamson will be the Final Four's Most Outstanding Player and then, two months later, the first pick in the 2019 NBA Draft. Mike Krzyzewski will secure his sixth national championship. Norlander: It's going to be an incredible story. The first No. 1 seed to lose to a 16. Then coming back a year later and win the whole freaking thing. 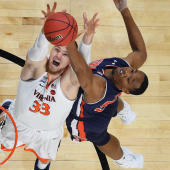 Virginia has rated as the strongest team in college basketball most of the season. They are still No. 1, right now, in more NCAA teamsheet metrics than Duke. They have a healthy team. Tony Bennett's offense has never been this good. Multiple pros. De'Andre Hunter, Kyle Guy and Ty Jerome are as strong of a trio -- on both ends of the floor -- as any in college basketball. And Bennett is too good a coach to not eventually break through to a Final Four. It's going to happen. Some might say it's going to happen ... eventually. But I look at at this team, this season and say it's going to happen this year. And then Virginia's going to write the greatest turnaround story in NCAA tourney history. This team is going to take the 2019 national title. Palm: Healthy Duke has been, without question, the best team in college basketball this season. The Blue Devils only loss at full strength came to the team I expect them to meet in the Final Four, Gonzaga. Zion Williamson is an athlete the likes of which we see once a generation. He'll lead his group to the title. Tennessee has the combination of talent and experience I like to see in NCAA Tournament teams. Led by All-American Grant Williams and Admiral Schofield, they have the weapons and the patience it takes to beat Virginia and reach the Final Four. Patterson: Duke over Kentucky: If the title game is going to be chalky, and I think it is, then we have to get some curve balls from somewhere, right? My bracket is a big bet on Jay Wright and a Villanova team that was inconsistent through the year but still has Phil Booth and Eric Paschall, two players with plenty of NCAA Tournament experience. Duke and Kentucky have already had injury setbacks and challenges to overcome in their path from starting to finishing the regular season as top-5 teams in the AP poll. I think both teams have emerged on the other side even more prepared to win a national championship, and the matchup between them in Minneapolis is close to a coin flip. I lean Duke because I'm not going to overthink it, and predict that Tre Jones, like his brother Tyus before him, plays a huge role in guiding the Blue Devils to a title. Boone: Despite Duke's abysmal averages from the 3-point line, its suffocating defense, its Hall of Fame coach and uber-talented roster makes it my pick. With Zion Williamson at full health, the Blue Devils have a do-it-all two-way player who gets most of his buckets at the rim, thus reducing the need to be great from 3. With he and RJ Barrett, it's clear that Duke has the top two players in this year's field. Dodd: The ACC rules! Well, if you consider three No. 1 seeds. But this time of year it becomes a half-court game. Because, someone, somewhere along the line will neutralize Zion and Duke. Virginia just doesn't have enough offense and there are too many memories of UMBC to have any faith in the Wahoos to make a run. North Carolina is interesting coming out of the Midwest because all three of Roy Williams' national championships have been won when his team was a No. 1 seed. Except the Heels won't come out of the Midwest, Kentucky will. That brings us to Gonzaga. Call it the Zags' Revenge Tour that started in 2017. The pride of the West Coast Conference -- still falsely labeled a mid-major by some -- lost by six to the Tar Heels in the national championship game that year. Since then Gonzaga is 62-8 overall; 10-5 against teams from power conferences. Don't be fooled by our last glimpse of the Zags, an upset loss to St. Mary's in the West Coast championship game. This is a veteran tournament-tested team with three seniors (one starter) in the rotation. The nation's highest-scoring team is complemented by a top 10 field-goal defense. Enough of that, the Zags are just fun to watch coming out of the West. Rui Hachimura has a chance to be the tournament MVP. The West Region Gonzaga has to come out of isn't particularly tough. Look for a grinder against Texas Tech in the regional final. The Zags will knock off Michigan State in the Final Four to get to Kentucky. They will not be intimidated. Nagel: Another expert going against the Duke trend by picking Virginia to beat Gonzaga in the Championship Game. Nagel has Michigan State beating Duke in the Elite Eight, while picking the biggest upset of the tournament -- Washington shocking North Carolina in the second round.